Just about everything is better with chimichurri sauce. 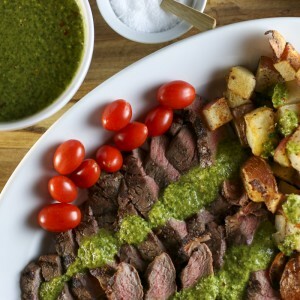 Chimichurri is a welcome addition to grilled steak, chorizo, chicken, tacos, fish, potatoes and vegetables. Chimichurri originated in Argentina where it was traditionally made with a mortar and pestle. Traditional chimichurri has chopped garlic, parsley, oregano, olive oil, fresh or dried chili pepper, red or white vinegar, salt and pepper. Other versions include onion, shallots, cilantro, basil, lemon, cumin, coriander, Spanish paprika, bay leaf, tomato and bell pepper. You can rough cut the herbs by hand, or blend them up smoothly in a food processor or blender. You can add chilies for a lot of heat or keep it more herbal. I make it a bit differently every time. Here is how I made chimichurri the last time I made it. Don't worry too much about the exact measurements. You can always taste and adjust to your liking. This recipe makes about 3 cups, way more than you will need for the average meal. Always make extra as you can put leftover chimichurri in the fridge for about a week. Leftover chimichurri will lose a little of its vibrant color on the second day. You can see the difference in color from the first night when I used it on steak, and a few days later when I served chimichurri on roast potatoes. Not as pretty after a few days, but still delicious. Leftover chimichurri means you will have a very happy and healthy week as all the ingredients have great health properties. In a food processor pulse shallot and garlic. Add herbs and pulse again to mince. Add lemon juice or vinegar, red pepper flakes, salt and pepper and pulse to combine. Add olive oil last. I like to drizzle the oil in slowly to create an emulsion, but you can also make chimichurri that is not emulsified, where the oil and herbs separate a bit. Hi Kim, or should I say “Hola”! I loved this recipe, you definitely pegged it in every way. You are absolutely right in specifying that it’s a flexible kind of recipe and so much fun to experiment with. Thank you for reminding me how easy and versatile Chimichuuri is. Remember, if you’re ever in our neighborhood to let us know and we’ll get together for an asado (with your chimichurri, of course!). All our best to all of you. Looking forward to your next dinner idea, as always! Gracias Valerie! That is quite a compliment coming from an Argentinean! Please share any special chimichurri twists you have. Argentina is on my travel wish-list. I’d love to share an asado with you! What to make for dinner?? I had some chicken to grill but that can be so boring. I decided to try the Chimichuuri sauce and it was delicious. So easy to make too. I drizzled in on my chicken served over rice with a tomato salad and done. Yummy.